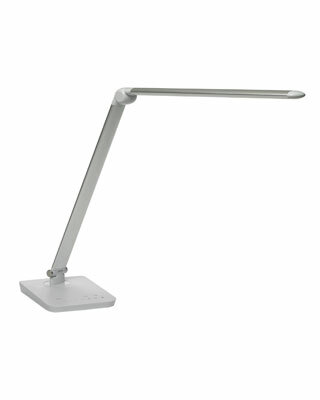 The Safco Vamp LED Desk Lamp has style that meets function and comes in various colors to choose from. The 1001BL (Black), 1001WH (White), or 1001SL (Silver) model makes a nice addition to anyones desk. This practical light features a multi-pivot flexible neck creating just the right light for every work project. In addition to being a very well made desk lamp, this clever light has a USB port in the back of the base giving you the option to recharge digital devices. The controls on the base feature a 7-step touch dimming function that includes warm or cool light settings which rounds this desk lamp as an EngineerSupply favorite. Input Voltage: 100-240V ~ 50/60Hz .5A, UL Listed Power Adapter included. Buy one today and start enjoying a steady light with just the right warm or cool setting that suits your need, as well as an adjustable neck that allows one to direct the light exactly where you need it with being in the way. Considering buying one for everyone in your office. These lamps are well made and feel good in the hand and look great to the eye which makes for an ideal gift for almost anyone. I'm enjoying this lamp !!! This lamp is an easy 5 stars! Works great and I love the warm and cool setting the most.